No stone is left unturned as you venture into parts of the South Island less travelled. From the wild and pristine natural wonderland of Stewart Island, to the spectacular vistas of Mount Cook, through to Milford Sound, where you will fall asleep under a blanket of mist and shadows on the still waters of the fiord. Enjoy travelling with no more than 20 like-minded guests. Day 1 - Welcome to Christchurch. On arrival at Christchurch International Airport you'll be driven by complimentary transfer to your hotel. Spend some time at leisure to relax or explore on your own. Perhaps visit the International Antarctic Centre or Orana Wildlife Park, New Zealand's only open range zoo? In the evening meet your Travelling Concierge for a Welcome Reception. Day 2 - Christchurch to Franz Josef. Accommodation: Te Waonui Forest Retreat, Franz Josef. Day 3 - The Mighty Franz Josef Glacier. Day 4 - Romantic Arrowtown and on to Queenstown. Day 5 - Queenstown Your Way. Day 6 - Queenstown at leisure. Day 7 - Queenstown to Milford Sound. Day 8 - Milford Sound Cruise and Kayaking. Day 9 - Milford Sound to Dunedin. Day 10 - Larnach Castle and Dunedin at Leisure. Day 11 - Dunedin to Christchurch. Day 12 - Farewell from Christchurch. Queenstown: Experience a first-class dining experience in one of Queenstown’s most popular and exclusive restaurants. Dunedin: Set in an old post office, this dinner is in a private room at Parcels Restaurant. Dining Summary: 11 Breakfasts (B), 1 Lunch (L) and 7 Dinners with Wine (DW). Christchurch: Journey on the iconic TranzAlpine Train. Christchurch: Visit the coastal town of Hokitika and find out about its local history. 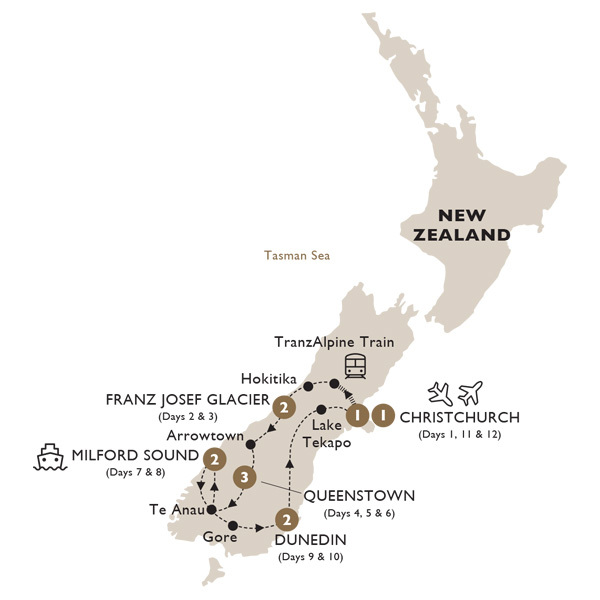 Franz Josef Glacier: Experience the impressiveness of this mighty natural wonder and meet a local jade carver. Haast River: Enjoy a fully enclosed jet boat ride down the Haast River. Makarora: Take part in an orientation in Makarora and hear about the beauty of this town. Queenstown: Experience Queenstown Your Way with a choice of joining a wine tour, viewing The Lord of the Rings film locations and scenery of Queenstown and Glenorchy on a scenic tour, or a relaxing massage in the spa. Queenstown: Take a walk in the Fiordland National Park to view the Chasm. Milford Sound: Sea kayaking is by far the best way to discover Milford Sound. Look out for the New Zealand fur seals, Fiordland crested penguins, famous blue penguins and even bottlenose dolphins. Tasman Sea: Board a cruise vessel and set sail out to the Tasman Sea. Dunedin: Take part in an exclusive tour of Larnach Castle. Christchurch: Stare in awe as you see Lake Pukaki and Tekapo, two of New Zealand's most beautiful lakes. Christchurch: Enjoy a day of sightseeing in the vibrant city of Christchurch. Franz Josef: Surrounded by natural rainforest on New Zealand's West Coast, Te Waonui Forest Retreat is a short drive from Franz Josef Glacier. This five-star retreat offers luxuriously appointed rooms which include organic cotton bed sheets, pillow menu and large private bathrooms. Luxury Gold is proud to offer various modes of transportation, from luxury coach to safari jeep and more, so that you always travel in comfort and experience your journey and destination in the best possible and most appropriate way.